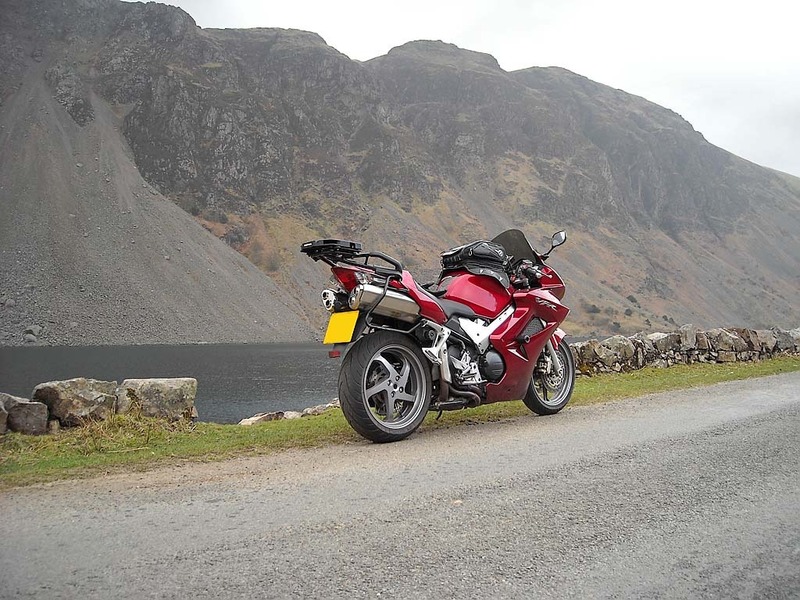 I went on a solo ride yesterday around the Lake District, taking in Kirkstone Pass, Whinlatter Pass and WastWater. I left home early and got to the Tickle Trout for around 9:00am, I was planning on filling up there and seeing if anyone from NUKB was about. The garage was shut with a back in 10 minutes sign posted on the shop and I couldn’t see anyone from NUKB about either. So I left join the M6 and headed straight up the M6 to junction 35 at Carnforth. From there I took the A601 and then turned right onto the A6. I carried on up the A6 stopping near Beetham for some fuel. After a while I joined the A590 towards Ulverston briefly before turning right and taking the A5074 to Bowness on Windemere. This road is starting to get consistent gravel on various corners (so take care if you use this road). Within no time of joining this road I came across a Police van heading in my direction, great I though. Would you believe he actually slowed down so I could overtake him safely without braking the speed limit. In no time at all I arrived in Bowness and did a right and left and joined the A592 heading to Troutbeck. After a brief comfort break in Bowness I carried on up the A592 and soon was at Troutbeck and the start of Kikstone Pass proper. I managed to negotiate Kirkstone Pass at a decent pace and also managed to pass some traffic very quickly and decisively on my way to Patterdale. (Got some great vid over Kirkstone see below) I carried on through Patterdale and then Glenridding and then I turned left onto the A5091 near Aira Force. I followed the A5091 for its entirety and then turned left onto the A66 to Keswick. Just after Keswick I took the B5292 in Braithwaite and went over Whinlatter Pass heading towards Cockermouth. After High Lorton I turned left and went through Southwaite and then turned left onto the A5086 to Cleator Moor. I then turned left in Egremont onto the A595 to Gosforth. 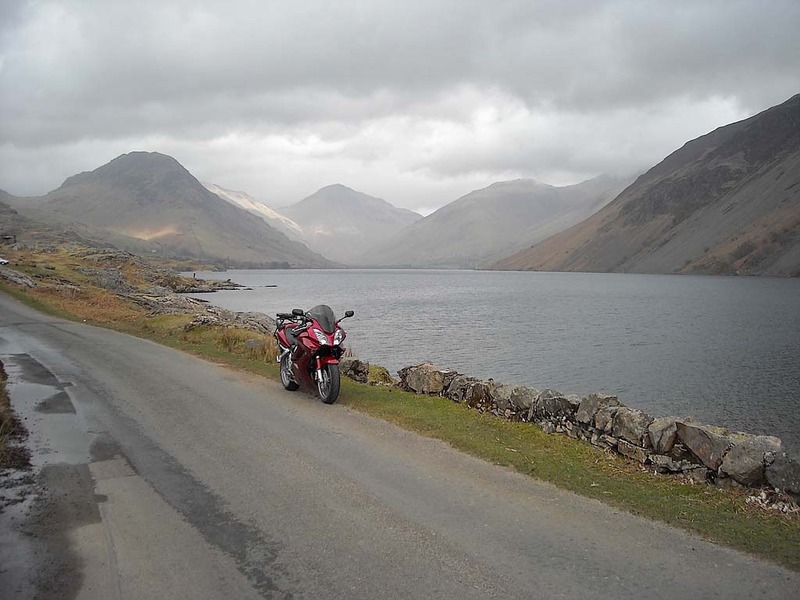 In Gosforth I turned left and went down several tight twisty roads eventually getting to Nether Wasdale and then starting the run down the side of WastWater to the end at Wasdale Head. 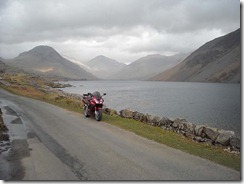 I arrive at Wasdale Head Inn at around 12:05pm for lunch, thankfully it had just opened at 12:00pm and was fairly empty so I got served very quickly indeed. After lunch I headed back down the road past WastWater again eventually arriving in Santon Bridge where I turned left for Eskdale Green. In Eskdale Green I carried on the road towards Ulpha via Birker Fell rather than turning left towards Hardknott and Wrynose Passes. 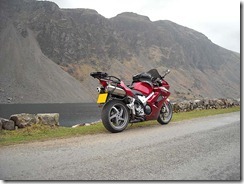 I turned right in Ulpha and headed over Dunnerdale Fells to the A595 at Duddon Bridge. I took the A595 all the way to Grizbeck where I joined the A5092 towards Greenodd. At Greenodd I turned left onto the A590 and took that road all the way to Junction 36 on the M6. 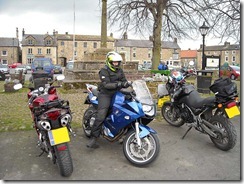 I crossed over the M6 and took the A65 to Devils Bridge where I stopped for a quick brew. 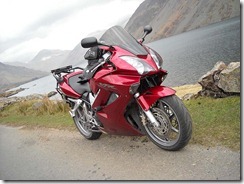 Birker Fell on Honda VFR800 Vtec from Cavturbo on Vimeo. After my brew I continued on down the A65 towards Settle. After Ingleton and just before Clapham I turned right and went over Clapham Common and around Stocks Reservoir by Gisburn Forest. At the end of this road I turned right onto the B6478 to Clitheroe via Slaidburn and Newton Fells. After Clitheroe I went over Pendleton Moor and through Sabden eventually coming out Simonstone. I then proceed on the A56/M66 back home. A total route of 280 miles from door to door. It took me about 7 hours in all, mainly because I was on my own. I probably only stopped for about 1 hour in all meaning a roundabout average speed of 46mph. 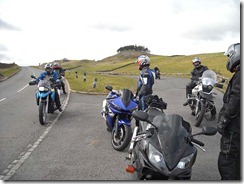 Helen and I went out yesterday with NUKB on a rideout around the Dales and past Tan Hill. 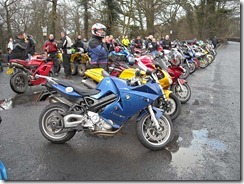 I planned the route and led the rideout employing the drop-off system, with Beamerbiker doing a great job of TEC all day. We set out from Clitheroe Services just after 10:00am heading down the A59 towards Gisburn. We turned left into Clitheroe and took the B6478 towards Slaidburn. On the drop down from Newton Fells I managed to get my left peg down, so it now matches my right hand peg. We turned left at Newton towards Dunsop Bridge where we then turned right to the Trough. I had a nice run through the Trough of Bowland once I had pushed myself past quite a few cars. I stopped at the crossroads in Quernmore to mark the right hand turn. Loads of bikes kept coming past me and a guy on a Pan stopped to tell me that the Police chopper was up over Devils. 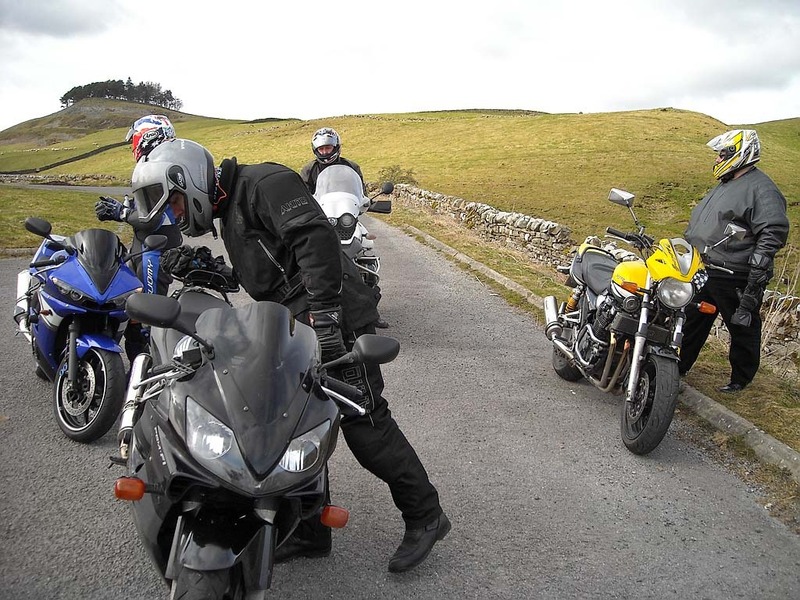 After a short while we all re-grouped at this point were Beamerbiker informed me that Scotsy had dropped off as he didn’t want to go to Devils Bridge with the expected Police presence. We set off from Quernmore towards Caton and turned right on to the A683 towards Devils Bridge. As we went through Caton we noticed several bikers pulled up by the Police. 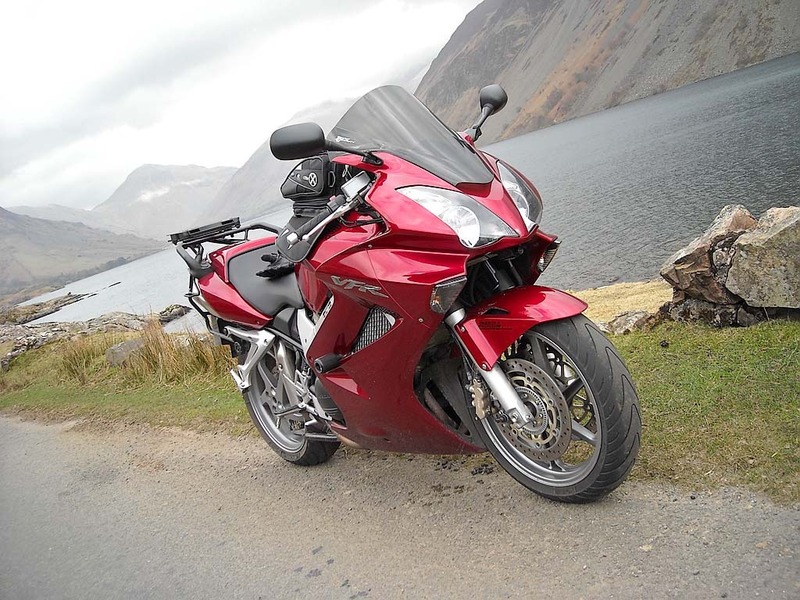 We carried on up the A683 to Devils taking it easy as nearly ever biker coming towards us was flashing and waving to slow down. The Police had set up a speed camera in Hornby, they where hidden behind a bush using mirrors on the camera to see people approaching without giving away their location. We arrived at Devils Bridge around 11:30am expecting a Police presence and free brews but no sign of them. Devils was stupidly busy so no one bothered to get a brew as the queues were to long. We left Devils Bridge just after 12:00pm seeing CJ and Ella just arriving. 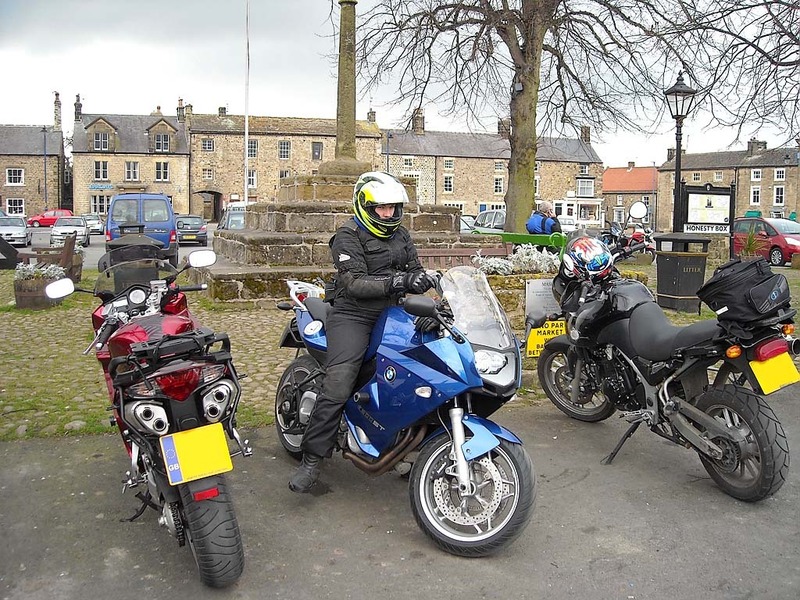 We headed on the A683 to Sedburgh, it was time to open the taps again as it looked unlikely the Police were about after what Pab had said at Devils. In Sedbergh we continued up the A683 towards Kirkby Stephen and turned right at the end of the road onto the A685 to Brough. 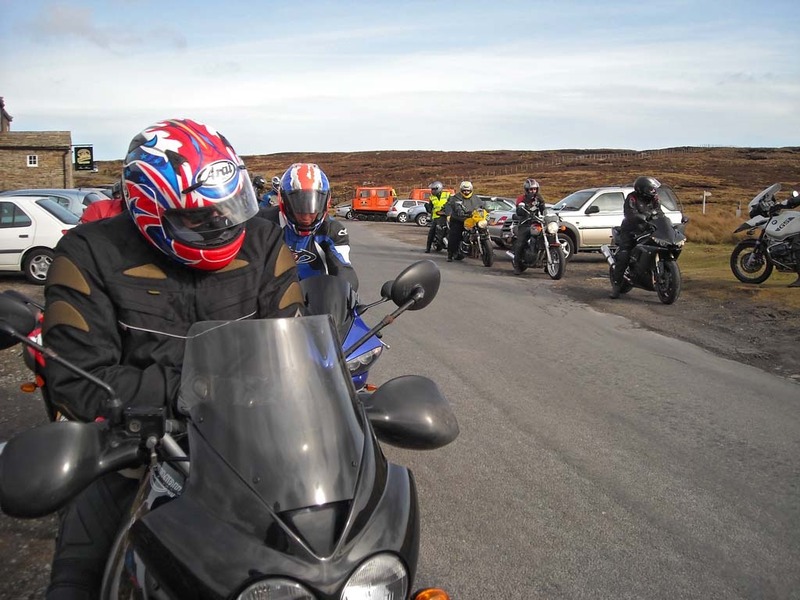 At Brough we took the fabulous B6276 towards Middleton-in-Teesdale. Hardly any cars about and lovely and peaceful and a sunny day what more can you ask for. Just before Middleton we re-grouped in a lay-by and then cut across to the B6277 towards Barnard Castle. We stopped in Barnard Castle for lunch. Helen, Debs, Andy and I had lunch in a cafe that was hidden down a small corridor. 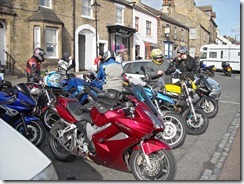 We stopped in Barnard Castle for about hour and set off at around 2:00pm. From Barnard Castle we cut across the A66 and headed through the Stang Forest to Langthwaite. We turned right at the end of the road and headed on up across Arkengarthdale Moor to Tan Hill. We stopped at Tan Hill to re-group where Dave answered a call of nature. 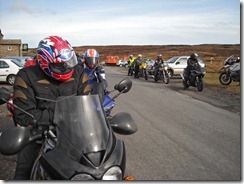 We turned left immediately after Tan Hill and head down over Stonesdale Moor to Keld. We joined the B6270 towards Muker and then turned right just after Thwaite and went over Buttertubs Pass to Hawes. We stopped at Hawes for some of the guys to refuel and then took my favourite road the B6255 to Ribblehead Viaduct. At Ribblehead we turned left onto the B6479 towards Settle going through Horton in Ribblesdale on the way. 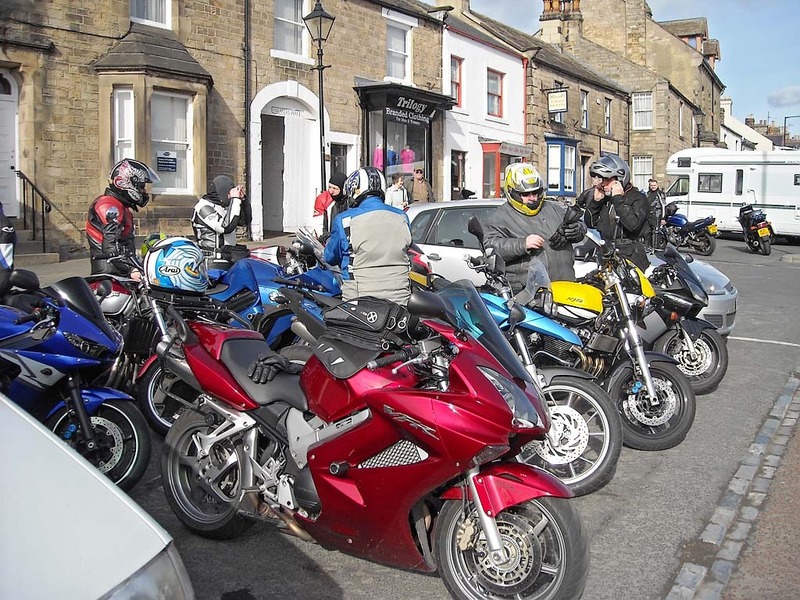 We stopped at Settle for a Brew in the Naked Man Cafe, mine and Helens usual afternoon rideout haunt. We left via the B6480 towards Long Preston and turned right onto the A65 at the roundabout. We then tuned left towards Rathmell continuing onto Wigglesworth. At Wigglesworth we briefly joined the B6478 before turning left again towards Sawley. We re-grouped in Sawley and then turned right after Sawley onto the A59 towards Preston. After going past Clitheroe Service we turned left on the A671 towards Padiham with the majority of the others continuing on the A59 towards Preston. From the posts on the Forum it looks like everyone had a really good day out. 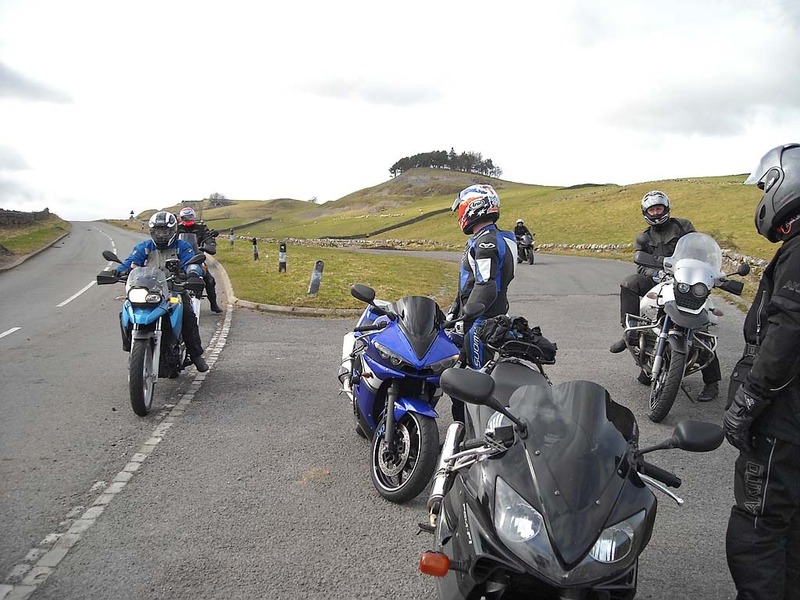 It was nice to meet a lot of new faces today, hopefully they enjoyed being on a group rideout and will come out with NUKB again. I had a really good day out and got well into the zone at times and have now removed any signs of chicken strips off my new tyres. It was a shame that the mic had got damp and broken on my bike as it was such a nice day to be capturing on-board footage. The new Ram Mount cradle for my Pocket PC TomTom system worked really well today. We also had the comms units working as well, the range is not what we hoped for but with a bit more practice we should be able to fine tunes things a bit. 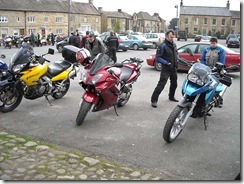 Helen and I went on a rideout today with NUKB to Masham. The ride was led by CJ with Scotsy doing TEC. 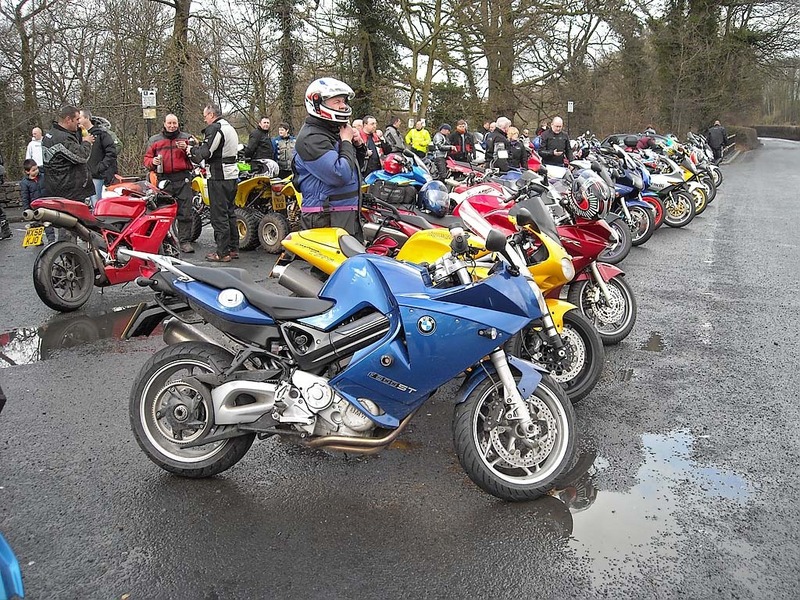 The ride was planned as a trial run for the Big Meet in April at Masham. A few us us met up at Clitheroe Services and waited for the main group to arrive from The Tickle Trout. We left Clitheroe around 9:45am and headed down the A59 to Skipton to meet up with some of the Yorkshire lads at the Little Chef. 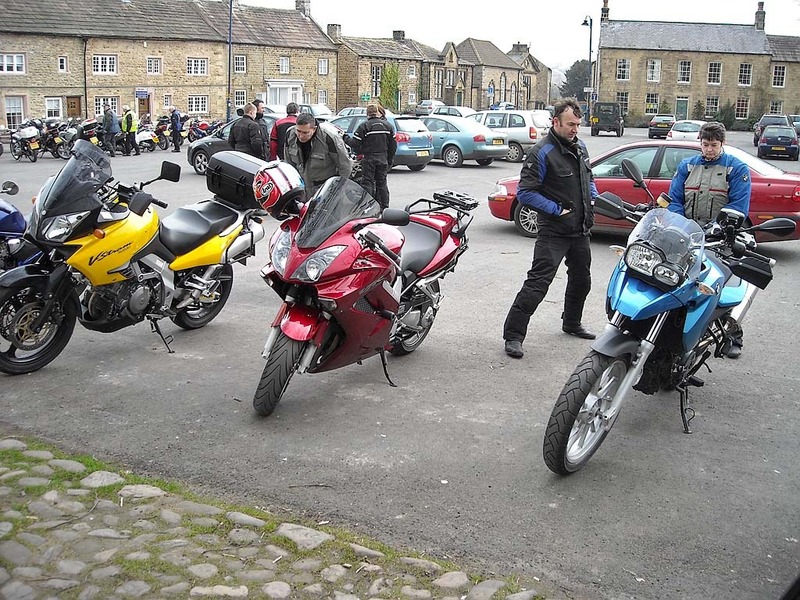 Once we had all met up we set out up the A59 and then took a left to Threshfield on the B6265. At Threshfield we hung a right to Grassington. 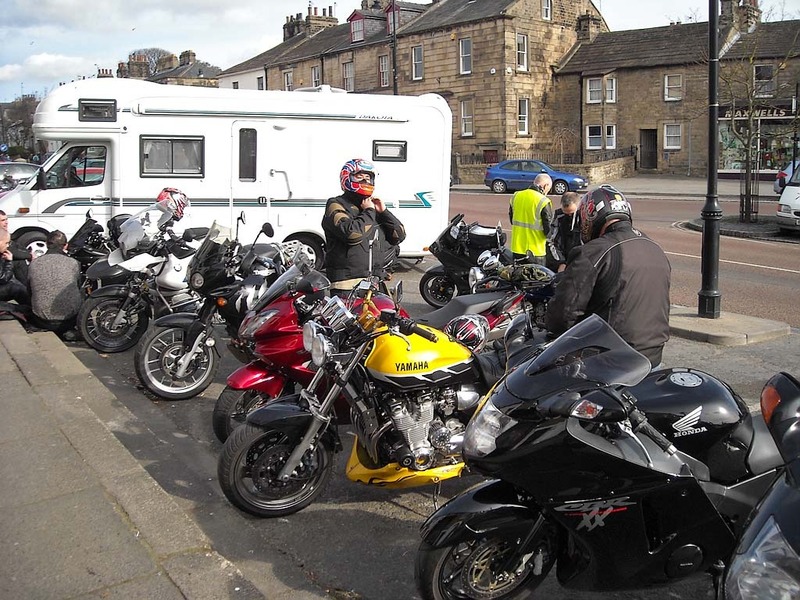 We stopped in Grassington for a quick comfort break then continued on the B6265 past Stump Cross Caverns to Pateley Bridge. We continued on down the B6265 to Risplith where we took a left onto some minor roads to Masham that went via Kirkby Malzeard and Grewelthorpe. We arrived at Masham at 11:30am which was a little too early for lunch. So after a brief break and a chat we decided to continue on to Hawes for lunch. We left Masham on the A6108 and just before arriving in Leyburn we took a left onto a minor road to cut around Leyburn. We joined the A684 after Leyburn and proceeded through Aysgarth and Bainbridge to Hawes. We arrived in Hawes at around 12:30am and stopped for lunch. Myself, Helen, Graham and Deb went to Crown Hotel as Helen wanted a more healthy lunch in the form of a jacket potato. After lunch we headed for Devils Bridge along the B6255 to Ingleton via the Ribblehead Viaduct. This run was slightly spoiled as we hit a band of heavy rain on the way. We were still able to have a decent run though. 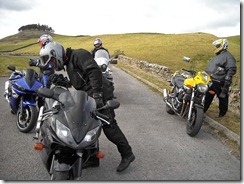 At Ingleton we turned right onto the A65 to Devils Bridge. We arrived at Devils expecting to see the Police there doing spot checks, but they were no where to be seen. Devils was quite busy considering that rain was about. After a short break our Leader CJ headed home via the motorway. 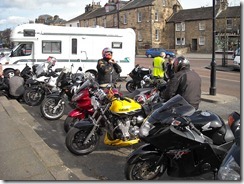 I led a small group from Devils down the A683 to Caton. After passing through Caton we turned left towards Quernmore. In Quernmore we turned left again and headed for Dunsop Bridge via the Trough of Bowland. As we came down Sniddle Holes to enter the Trough I saw the blades of a helicopter and then I rounded the next corner and saw a Ducati crashed into the front of a Micra. The helicopter was the air ambulance and was just landing. Seeing as the air ambulance was on scene I didn’t see any point in stopping and getting in the way, so I carried on. We waited at Dunsop Bridge for everyone to regroup and then turned left to Newton. In Newton we turned right onto the B6478 for Clitheroe. We went through Clitheroe and turned right onto the A59 and then 4 us turned left on the A671 for Simonstone, the rest travelled on the A59 bound for Preston and beyond. The 4 of us then took the A6068 for the M65. At the M65 2 us dropped off leaving just Helen and I to head home via the A56/M66. Update: Scotsy mentioned on the forum later that he had stopped and talked to the Ducati riders pals and they said that he was ok.